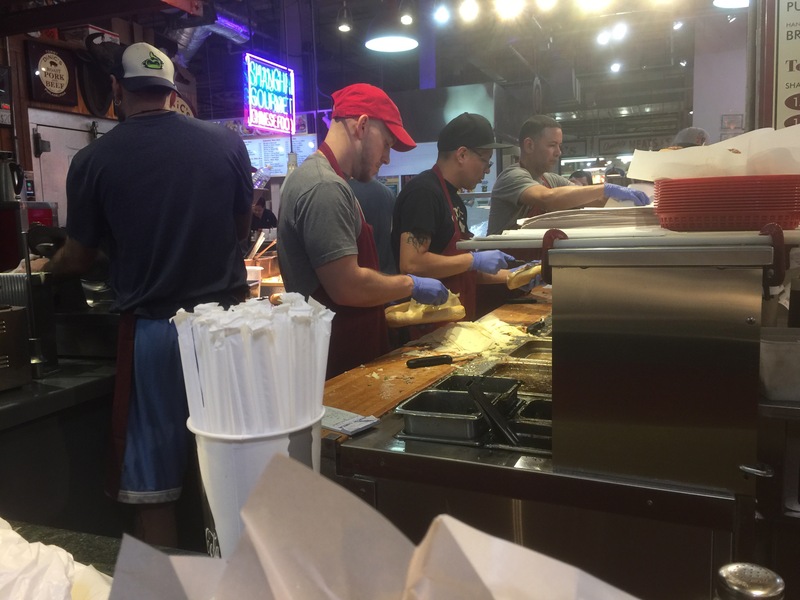 I had never been to Reading Terminal Market in Philadelphia before, but had heard about it. It’s a bustling place filled with butcher shops, green grocers and so on, but has also emerged as a extremely intense food court. In fact I think there are more purveyors of hot, finished food than there are butchers and grocers and the like. The aisles are cramped and crowded with what I took to be ten tons of tourists like me. Popular spots draw long lines that snake through the crowd, around corners and so on. It doesn’t help that the place is packed with gawping schmucks like me, who only add to the challenge of maneuvering since we’re too busy looking around and not busy enough watching where we are going. Consequently, you’re shoulder-to-shoulder, start-stop stepping, with a hundred “excuse me”‘s as you try to oh-so-gently shove your way to where you’re going. If you’ve a phobia about personal space, Reading Market is not the place for you. That said, I enjoyed visiting it, it reminded me of the wonderful Italian market on Arthur Avenue. Amid all of this, in a place slightly off the center of the court, is Tommy DiNic’s. I’d heard about it (being a good foodie) for quite a while. People always mentioned it when I’d have the “where’s the best cheesesteak in Philadelphia” conversation. 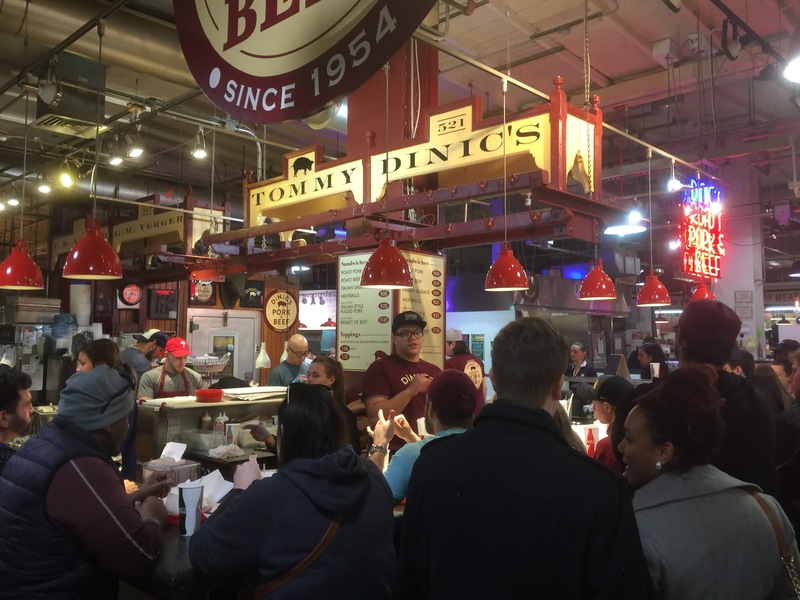 DiNic’s doesn’t precisely make a cheesesteak, per se, but what they make is awfully good, and I can see why they keep surfacing in those conversations. 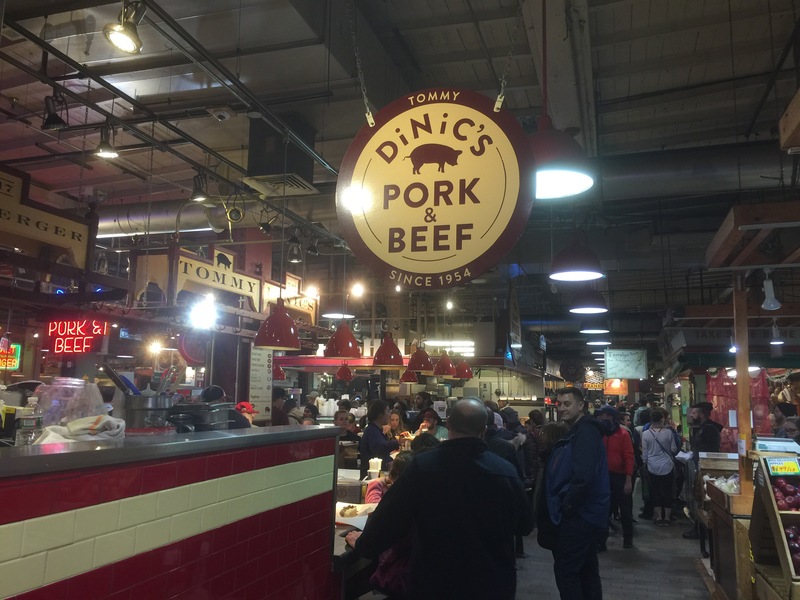 DiNic’s serves up Italian roast pork and beef sandwiches. And yes, you can get them with provolone, so I suppose that would make (at least one of them) a cheesesteak, but the sandwich I had there was completely unlike – and vastly better than – the Mutt & Jeff cheesesteaks I’d previously had in Philadelphia, which were broadly deeply disappointing. The line at DiNic’s was pretty much what you’d expect. The place is a small square, with two of the sides of the square being a counter with bolted stools. It’s packed, and enveloping those filled seats is the line, which when I approached wrapped around about two and a half of the four sides of the square. That said, the line moved swiftly (happily). The folks behind the counter were friendly and efficient, which is a bit of a surprise considering how swamped, hot and busy they must be all day. I arrived, I should add, at around 3 p.m. on a Saturday, so I can’t quite speak for what things must be like during primetime. I wasn’t sure precisely what to order, and admittedly had come there for the storied Italian beef, but for some reason at the last moment I opted for the roast pork. I am thrilled I did, it was delicious. I got it with provolone and broccoli rabe. 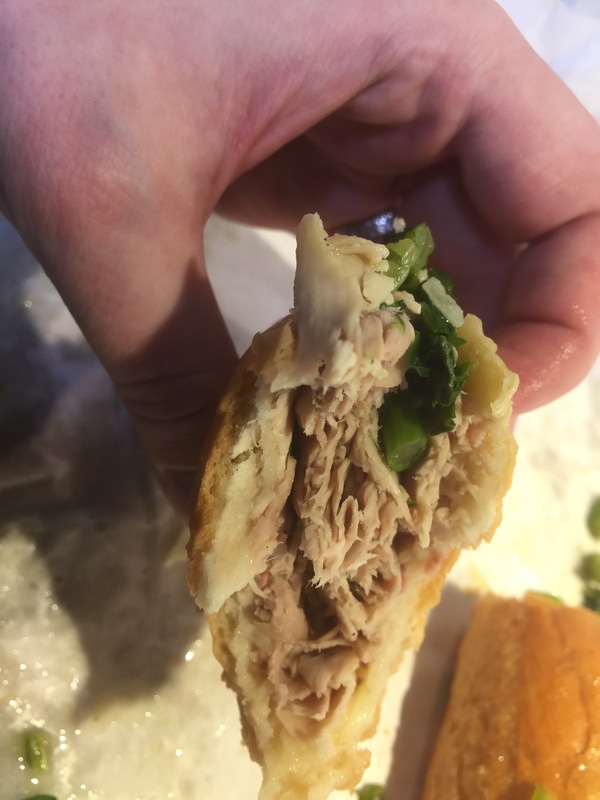 The notion of throwing broccoli rabe on the sandwich (which they’ve been doing forever) is, to me, audacious, and I felt I had to go for it, since I am not particularly a broccoli rabe fan. So I wanted to find out what they were thinking. It’s kind of like the the octopus pastrami on the menu at Batard: That’s so unusual I have to try it. And much like Batard’s signature dish, you’ll be glad you did. The sandwich is substantial and reasonably priced. The basic roast pork or beef is $9, plus $1 per topping or $1.75 for two. The menu is limited: Roast pork, roast beef, pulled pork, sausage, meatballs and brisket. The sandwich is perhaps 10 inches or a foot long. Amazingly, there was a free spot at the counter, so I jumped on it. I was initially concerned when I unwrapped the sandwich: The loaf of bread doesn’t immediately impress (I’ve had much, much better bread at other delis, and we all know how important the bread is to a good sandwich). The loaf is very light, the crust faint and undemanding, though the bread itself is sweet. That said, it’s sneaky: Even though the bread doesn’t immediately read as crunchy, fresh and “awesome,” it won me over in a hurry. It excellently fulfills it’s vital task: Sopping up the vast, vast volume of juice that’s drenching the pork and rabe. It is clearly a choice, and I get why they went with it. The sandwich is sopping. It’s more akin to a french dip that what you’d think of as a cheesesteak. Happily, though, most of that juiciness is on the inside of the bread, so unlike a french dip, it’s easier to handle. The sharp provolone it’s served with was, frankly, a bit blander than I was hoping for. I was hoping for some of that sharp attack flavor that provolone can render. It didn’t, on it’s own, particularly pop, in my opinion. The cheese isn’t served in round slices, but rather in hacked-up, thin chunks of cheesy debris. It adds a fat flavor. So you’ve got sweet bread, added fat from the provolone, and then sweet and juicy roast pork. Even though I ordered roast pork as opposed to pulled, it completely fell apart, which was wonderful. All in all you’re looking at a hot, sweet confection, but then comes the transformative element: The rabe. It’s tartness is vital for cutting through all that sweet and fat flavor. Everything balances out beautifully. On balance the sandwich is delicious and a winner, easy to recommend, especially at around $11 or $12. 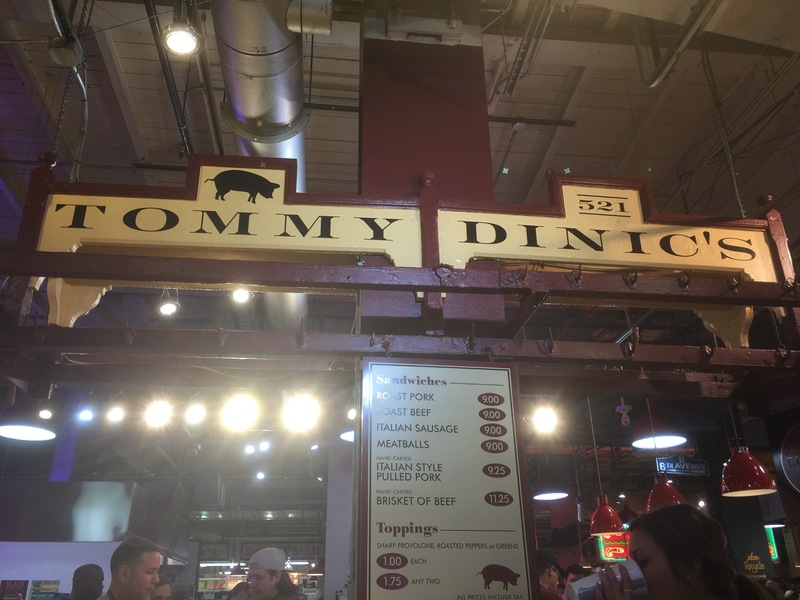 It was by far better than the cheesesteaks I had in Philadelphia, and I look forward to returning and trying the beef and other offerings at some point. Once, many years ago, I attempted a list of “best sandwiches.” If I were doing it again now, this place would easily merit consideration for a spot on the list. It’s lovely. After, I spent a few moments strolling around the market. There was a donut shop with a line so long a patron near the front of it said he’d been waiting for an hour and a half! I look forward to returning and trying one, but there’s no way I’m waiting 90 minutes for a donut. On my way out I ordered a fresh-squeezed cannoli from Termini brothers. The shell was nice and crispy, the filling tasty, and made a nice finisher for the indulgence.